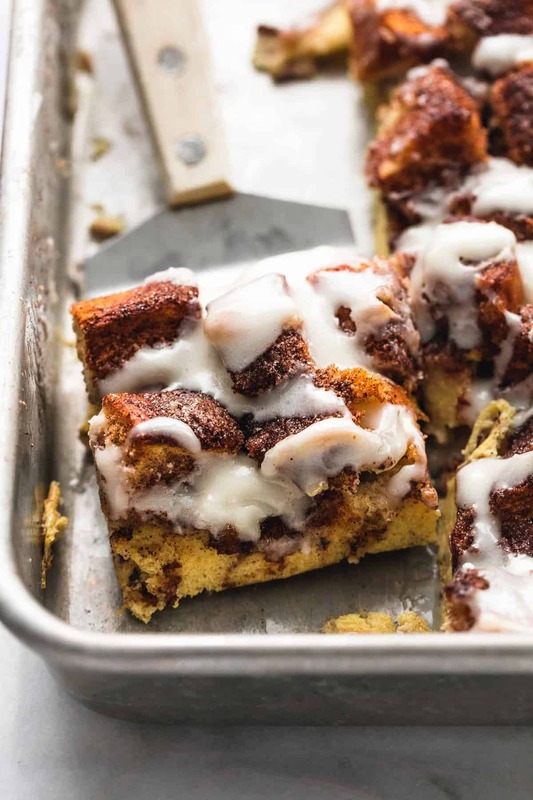 Overnight Overnight Cinnamon Roll French Toast Casserole combines the best parts about cinnamon rolls and French toast into an easy make-ahead breakfast! I love a good holiday breakfast or brunch recipe that requires minimal work and packs maximum deliciousness! I’ve been testing out breakfast recipes for Christmas morning this year and I’m telling you right here, right now, this is the winner. Everyone goes crazy for this, even my super picky two year old twins and that is saying something because normally the only breakfast food they will eat is cereal, peanut butter toast, and waffles. And we’re not talking about my favorite homemade, super fluffy Belgian-style waffles, we are talking frozen waffles. They don’t even dip them in syrup! They’re strange kids. 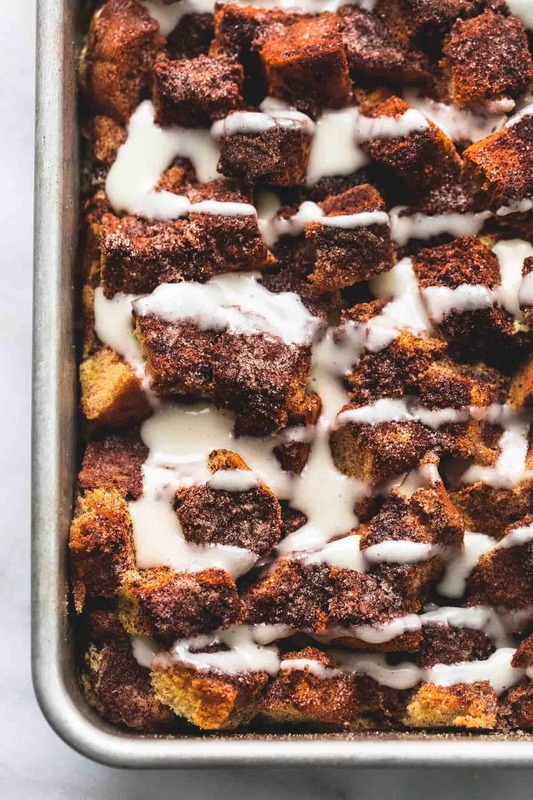 After telling a little white lie and convincing the kids that we were eating donuts (don’t judge) they tried it and completely loved this French toast casserole. But how can you not when it tastes like a cinnamon roll?!? 2) Cover the first half with a sugar + brown sugar + cinnamon mixture, then top with the second half of the bread cubes. Pour the milk mixture (consisting of milk, eggs, vanilla, and a little sugar) over the top of the bread cubes. Cover tightly and refrigerate overnight or up about 8 hours. 3) About an hour before serving, remove the pan from the fridge and uncover it. 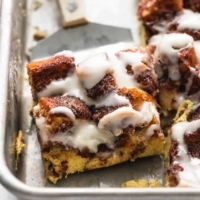 Sprinkle cinnamon and sugar over the top, and then drizzle with melted butter. Bake for 35-45 minutes until the bread is golden and cooked through. 4) Whip up a super easy cream cheese glaze with cream cheese, butter, vanilla, powdered sugar and milk. Drizzle over the slightly-cooled casserole and serve. 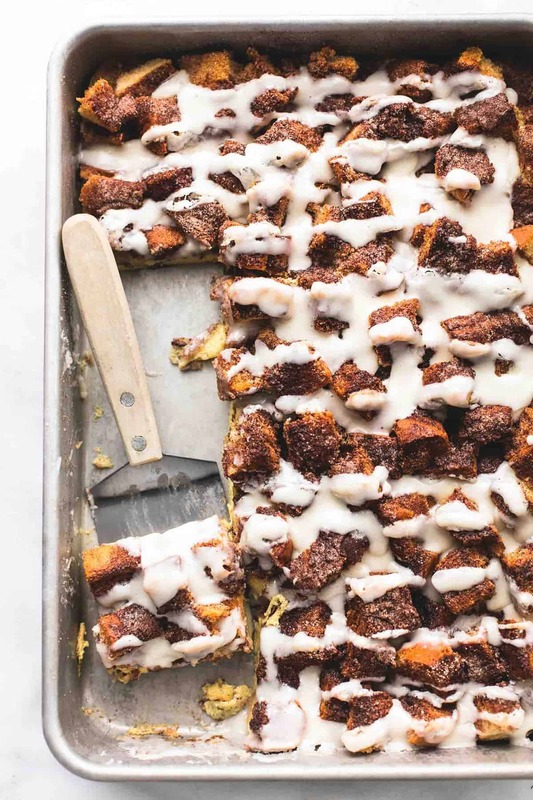 Your family and friends won’t be able to resist this tasty Cinnamon Roll French Toast Casserole. Tastes like a cinnamon roll, feels like French toast, this is the perfect blend of your favorite breakfasts in an easy and simple make-ahead form! The best part about a make ahead breakfast casserole is that it doesn’t take you away from the fun on those special mornings. Spend just about 15 minutes the night before, and about 15 minutes the morning of doing the work, and then pop it into the oven and breakfast is served! 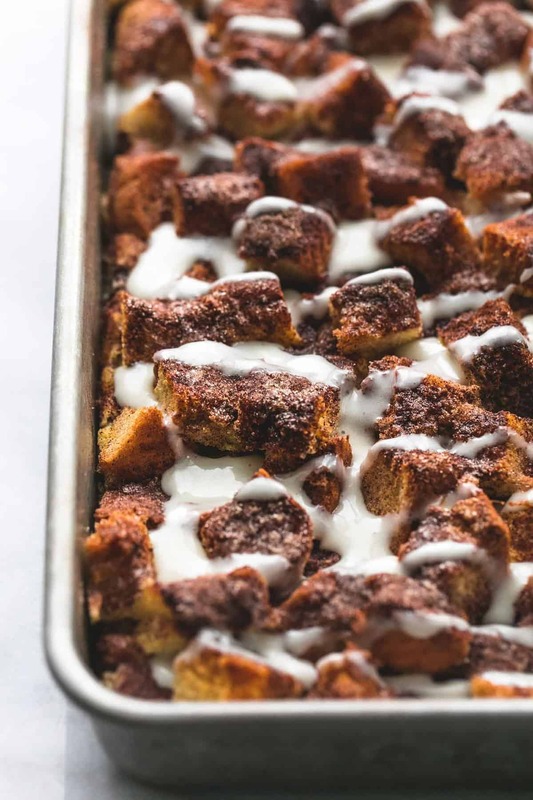 Easy Overnight Overnight Cinnamon Roll French Toast Casserole combines all the best parts about cinnamon rolls and French toast into one easy make-ahead breakfast! 12 slices thick Texas-style white bread very soft, very thick white bread - often called "Texas Toast"
Cut bread into 1-inch cubes. Lightly grease a 9x13 inch baking pan/casserole dish and layer half of the bread cubes in the pan. In a small bowl mix together 1/4 cup sugar, 1/4 cup brown sugar, and 1 tablespoon of cinnamon (I use a fork for this). Sprinkle mixture over bread cubes in the pan. Layer remaining half of the bread cubes over the top. Whisk together milk, eggs, vanilla, and sugar. Pour over the bread cubes (being sure to pour over all of the cubes, not just right in the middle). Cover tightly with plastic wrap and chill overnight in the fridge. Mix together remaining 1/4 cup sugar and 1/2 tablespoon (about 2 teaspoons) cinnamon and sprinkle mixture over the top of the bread cubes. Drizzle melted butter over the top. Bake at 350 degrees for 35-45 minutes until browned and bread is baked through. Bake at 350 degrees for 35-45 minutes until browned and bread is baked through. While French toast is baking, prepare the icing. Cream together cream cheese and butter until light and fluffy. Mix in vanilla and 4 tablespoons milk. Gradually mix in powdered sugar until completely incorporated. Add 1-2 tablespoons of milk if needed to make icing pourable. Pour over slightly cooled French toast casserole and serve. Recipe requires 15 minutes of prep the night before + overnight chilling + and 15 minutes of prep in the morning + 35-40 minutes of baking time. This sounds absolutely delicious! While i don’t normally eat such sweet stuFf who can resist cinnamoN roles? I will definitely try this for Christmas morning and can spot a keeper when i see one. I have Tried several recipes from this site and loved every one. Hi how do you think this would go serVed cold as picnic item? Hi Marianne — I definitely prefer it warm, but it could be delicious cold as well. Let me know how it goes. I did it and althoUgh i’m sure it is better warm, it was well recEived!